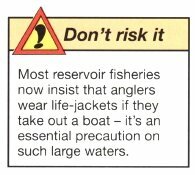 Pike fishing on reservoirs is becoming increasingly popular – especially since more and more trout venues are opening their gates to the pike angler in autumn and winter. 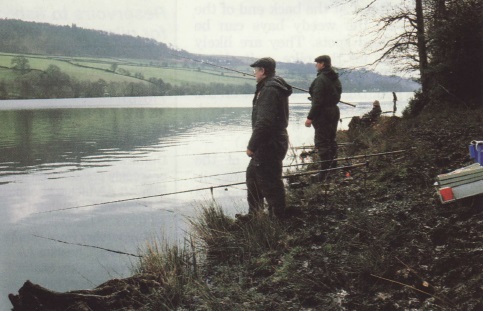 The prospect of a huge fish is a great incentive to specialist pikers. Reservoir structure and appearance vary greatly, from basic man-made bowls with little in the way of fish-holding features to the attractive-looking waters formed by damming off and flooding valleys. Dams and one or more valve towers are the characteristic features of reservoirs, but the bankside and underwater features on large still waters can differ greatly. Flooded valleys, for instance, may have lots of attractive bays, large areas low water and a huge variation in depth and bottom. There may be troughs, large humps and ledges - all features that are likely holding locations for the prey fish species that pike feed on. Man-made, bowl-like waters have sides that simply slope away into the deepest water. Their only features are valve towers, a culvert and weedbeds at certain times of the year. The bottom slopes to the deepest part in a perfectly regular, uniform way - there are no interesting humps or bumps winter when prey fish move into the deeper, warmer water to take advantage of the shelter offered by the walls. Tackling these huge reservoirs is just like fishing on many other big still waters, from the venues of the Lake District to the lochs and loughs of Scotland and Ireland. The approach is for the most part very much the same- except that few reservoirs permit trolling in any form and none allows trolling with artificials under the power of an outboard engine. The way to locate hotspots, and the tackle and techniques you which could make pike holding areas. Abberton Reservoir in Essex, for instance, have proved to be exceptional spots for producing large hauls of big pike. In most cases the deepest areas on a reservoir are those around the valve tower and the dam wall. These attract many pike - especially in use, are also similar. Most live and deadbaiting methods are suitable, as is lure fishing. 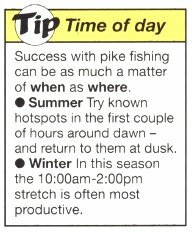 Whatever water you intend fishing, always try to find some kind of feature that is likely to hold pike. For locating big water pike, look for any rocky outcrops from the shore or peninsulas reaching out into the main body of water. There are usually underwater features linked with such landmarks, and they have good variation in depth of water. Such spots almost always have pike in residence- or are at least patrolling areas for feeding pike on the lookout for prey. Bays with steep sloping points are noted spots- it's especially worthwhile to fish the deep water here. Flat fields that reach the edges of a reservoir often mean shallow water for a good distance from the shore. These shallows are not so hot - although if the water is warm and prey fish move in, then the pike will follow and may show, or cause a flurry of activity among fry and small fish. Keep an eye on them. In times of high water bankside bushes, trees and areas of marshland are submerged and pike love to creep through such places on the hunt for food. Weedy bays are holding areas for most species during the warmer months of the season: tench, carp and bream may still be spawning and big pike- if not already in residence- will not be too far away, so these areas are always well worth trying. ​Autumn and early winter In September and October the pike begin to move to deeper water to feed up for the winter. You could be on for a big bag at this time. Late winter Right at the back end of the season (March) the weedy bays can be exceptionally good spots. They are likely patrolling areas for the pike, quite large packs eventually gathering in preparation for reproduction. Big catches can be on the cards for anglers who are well prepared. Consistency counts on many of the waters, hotspots - once located – remain productive all year long. Fish are caught in all sorts of weather, from heatwaves to severe frosts, because they stay close to the characteristic reservoir features. However, on some heavily stocked trout reservoirs, food is everywhere- and so are the pike. Unfortunately, far too many anglers fail to look for the particular pike-holding features- with the result that they don't catch as often or as much as they would like. Ledges and drop-offs can be very close to the bank, yet some anglers remain obsessed with casting their baits to the far horizon. Concentrate instead on fishing a variety of depths along these features.